Borelle Kanatte Cemetery is one of the most beautiful places in Colombo. It is the main burial ground for people from all faiths. Why Borella Kanatte Cemetery is special ? The Borella Kanatte Cemetry is the main burial ground for people from all faiths in the city of Colombo. The cemetery is the final resting place of several Sri Lankan luminaries. It has a separate section for the people who died during the two world wars. As of today, there are over 60 graves for people who died during World War I and around 300 graves for people who lost their lives during World War II. Although, visiting a cemetery seems morbid, the Borella Kanatte Cemetry is a very green place. The 50 acre stretch of the cemetery is ripe with manicured gardens and mature trees. It’s a really peaceful place where you can sit and contemplate. 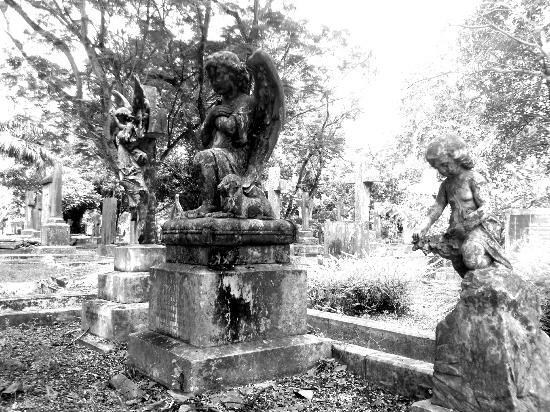 What to explore at Borella Kanatte Cemetery? The cemetery has some of the biggest trees you've ever seen in Colombo. The place is massive and fresh with flowers, plants and birds, and neat petal-strewn pathways that meander through the grounds. The main area of the grounds is ripe with Christian symbols but people of others faiths have been buried here as well - you'll find a different section flanked by a Buddhist funeral center if you wander in far enough. A lot of famous people in local history have been buried here, including Arthur C. Clarke, some of our film industry's actors and actresses, and even those who died at war. In addition to the Sri Lankan graves, there are also interestingly a series of Indian, British, Australian and French ones. The tombstones carry the stories of people who have been gone for ages, and occasionally you'll find a line or two of beautiful poetry on some marble. Some of the graves are very simple, with a cross or a slab, or quaint intricate stone-work, while others have mini-monuments in the shape of domes or angels set up on them. Angels everywhere - in white, grey and sometimes black. Some of them point at the sky, others are in the form of children, while some look smilingly at the ground. It can get spooky if you linger around and look at the statues too long (it's probably scary at night but the gates are locked at around 6PM), but mostly the place gives off a very meditative vibe. With the large trees shading the green floors, and the bright bushes of red and purple flowers, and the memories of people who once lived among us carved in stone, walking through here alone can be a compelling experience. How to get to Borella Kanatte Cemetery? These have yellow tops and red and white plates. In Colombo, taxis are metered but it is advisable to agree a rate before setting off. Drivers expect a 10% tip. The best time to visit the place to observe funeral ceremonies is in the evenings between 4.30 p.m and 6 p.m any day except Fridays. There are separate sections for the burial of Catholics, Anglicans, Buddhists, and Hindus. The place is massive and fresh with flowers, plants and birds, and neat petal-strewn pathways that meander through the grounds. Situated in the heart of Borella right in front of the Borella roundabout. This could be accessed from few sides and is very considerably large in size. Allowed for all religions and is well maintained. Always makes me think how peaceful this place is.